A loan of $300 helped a member to buy a packet of seeds and fertilizer to grow peanuts. 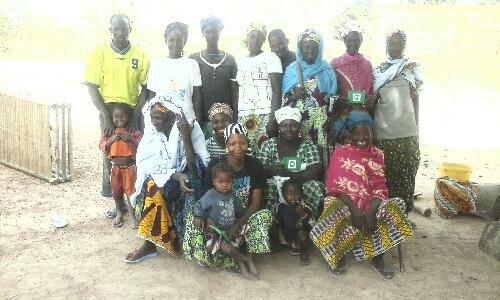 Mamakan, who is found in the center of the photo holding the myAgro envelope, is a member of a group of 13 agricultural producers who live and work in the village. She is 38 years old and lives in a family of 65 people. She has 8 children, their ages are from 4 to 16 years, of which 5 among them are sent to school. She became a farmer by tradition. She chose to enroll in myAgro for the payment system. For her second year with myAgro, Mamkan bought a packet of PDS peanuts with okra for her 1/4 hectare field. Through this purchase, Mamakan hopes to be able to increase her yields in order to develop her goat farming and insure food self-sufficiency. Translated from French by Kiva volunteer Margo Berends. View original language description. Mamakan qui se trouve au centre sur la photo, tiens la pochette de myAgro, est membre d'un groupe de 13 productrices agricoles qui vivent et travaillent dans le village. Elle est agée de 38 ans et vit dans une famille de 65 personnes, elle a 8 enfants, leurs ages vont de 4 à 16 ans dont 5 d'entre eux sont scolarisés. Elle est devenue agricultrices par la tradition. Elle a choisit de s'inscrire à myAgro pour le système de paiement. Pour sa deuxième année avec myAgro, Mamakan a acheté un paquet d'arachide PDS avec gombo pour son champ de 1/4 ha. A travers cet achat, Mamakan espère pouvoir augmenter ses rendements afin de développer son élevage de chèvres et d'assurer l'autosuffisance alimentaire. It allows farmers to access high-quality inputs to increase yields and income. Each farmer has selected a planting goal earlier in the year, and they then purchase pre-paid myAgro scratch cards using their mobile phones to pay for high quality fertilizer and seeds on layaway. This is a transparent and flexible way for farmers to pay for the agricultural inputs they need each season. myAgro will deliver the fertilizer and seed packages each farmer has purchased to each village before planting time and provide technical training and weekly on-farm field follow up to enable these farmers to increase their yields and income by 50-100%. Though the farmers have not yet completed their layaway plan, it is time for myAgro to purchase seeds and fertilizer for these farmers in order to ensure that everything is ready in time for planting in June. This Kiva loan will cover the cost of those inputs not already covered by these farmers' layaway payments, and will thus be used to provide borrowers with needed goods or services, as opposed to cash or financial credit . Inputs will be purchased in March, and this loan will be repaid in July and August, once farmers have completed their savings packages and received their input packages. myAgro is a startup nonprofit organization in West Africa that enables farmers to purchase high-quality agricultural inputs - certified seeds and fertilizer - on layaway through an SMS-based platform and a network of local vendors. Additionally, the organization helps farmers to increase their crop yields by using more effective seeding machines. Kiva lenders' funds are used to help these farmers afford more labor-reducing and cost-effective seeding machines through loans with low interest rates so that they can increase their yields and improve their quality of life. Like Kiva, myAgro is committed to improving living standards for poor people in rural areas. The organization believes that finding scalable solutions to help farmers invest in their fields can help a large percentage of the world's poor get out of poverty while also feed a growing population.